Since my momma didn't raise any, I knew right away that this fool was something special. 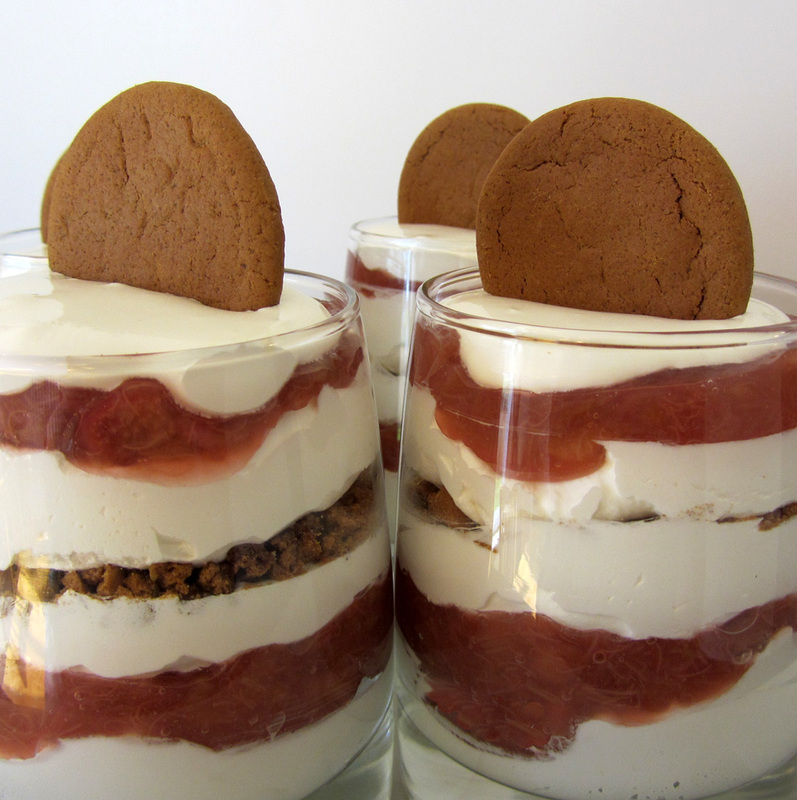 Rhubarb, whipped cream, and gingersnaps. I'm practically drooling! The dessert isn't named because any fool can make it (although this has to be one of the simplest dessert recipes there is), but as a derivation of the French word "fouler" or puree. A fool is a classic British layered dessert of sweetened fruit puree (well, vegetable in this case) and whipped cream. The cookies are just a bonus! I found this delicious recipe on Cookin' Canuck. I did make a couple of very small changes. First, I really love tart flavors, but felt that the compote needed to be just a bit sweeter, so I increased the sugar from 1/3 cup to 1/2 cup. This compote is so good, I'd be happy to eat it all by itself! Also, the recipe calls for 1 cup of cookie crumbs. I garnished with whole cookies on top, so only used a 1/2 cup of the crumbs. And, finally, I just don't like straight whipped cream, so I used Cool Whip instead (this also gives it a longer refrigerator shelf life). Clearly, using whipped cream would result in a more sophisticated and potentially more attractive dessert. So, choose the one you like best. 1. Toss the rhubarb with the sugar in a large saucepan. Cover and let rest for 15 minutes to allow the rhubarb to release some of its juices (you can also cover and chill for a few hours if you prefer). 2. Set the pan over medium-high heat. Bring to a boil. Reduce the heat to medium-low. Simmer, stirring often, for 12-15 minutes or until the rhubarb is very tender. 3. Transfer the rhubarb to a plate or bowl. Allow the compote to cool. Cover and chill for 2 hours. 4. Whip the cream and powdered sugar to stiff peaks. 6. Serve (if you used Cool Whip, you can cover and chill and serve at a later time).